Are you fed up with your saw binding in cuts while felling trees? Do you need help setting the direction of the tree you are felling? Look no further as the Oregon felling wedge is here to help you! Read the following Oregon Felling Wedge Review to find out how this plastic wedge tool can help prevent saw binding in cuts and help in the tree falling and bucking. This, however, is a felling wedge, and not a best wood splitting wedge, so it cannot help split wood. It, however, is handy for controlling a tree’s fall and is very much in demand amongst professional loggers. It has serrations on its side that hold it securely in place while felling trees, so there’s no worry about it slipping or bouncing out once hit into place. It is also strong enough to withstand blows by axes and mauls. 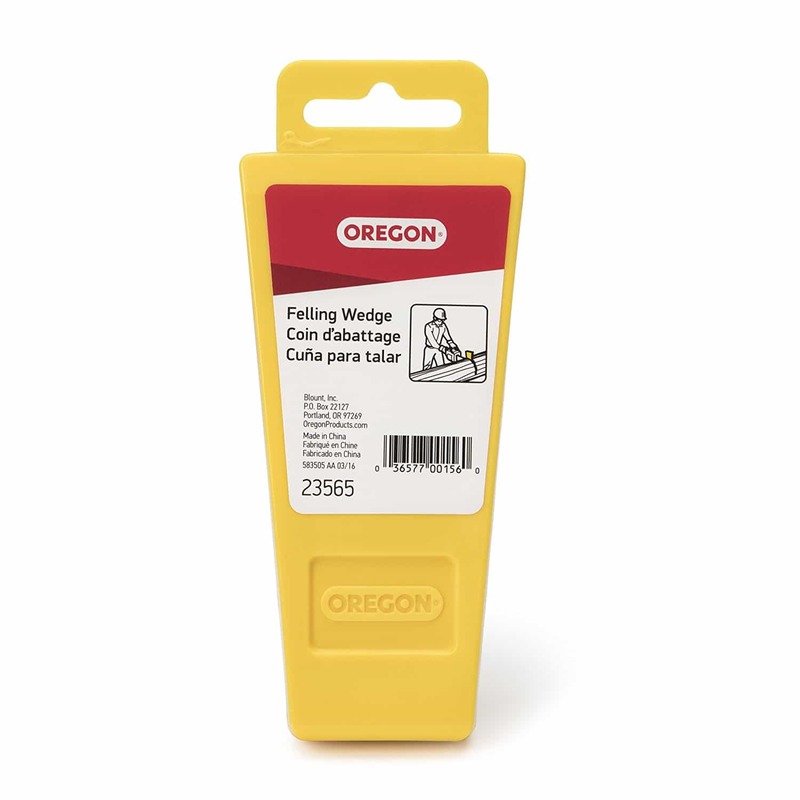 Though the Oregon felling wedge a plastic one, it’s robust and sturdy heavy duty plastic. It’s durable enough to withstand hammer hits but won’t harm you or your chainsaw if accidentally cut into it. The plastic felling wedge has non-slip serrations or ‘teeth’ on one side. The serrations are what holds the wedge securely in place and prevent it from getting squeezed back out once driven into the gap. This plastic wedge is meant just for felling trees and bucking woods, and not for splitting logs for firewood. This is why they are very popular amidst arborists and foresters. It’s, in fact, better to have an excellent collection of felling wedges in your tool arsenal while felling trees as it helps a tree fall precisely where you want it to. Placing the wedge into gaps in the wood prevents saws from getting pinched by the wood. So it proves helpful, and necessary if your chainsaw is stuck, and you need something to open the cut and use another chainsaw to remove it. It is also useful in controlling the direction of the tree fall. The Oregon felling wedge is an essential tool to have while felling trees as it can control the course of the tree fall. This is a vital precautionary measure to take for reducing the chances of any injury occurring because the tree falls in the wrong or unexpected direction. Besides, felling wedges are useful for protecting the saw blade from possible damage while cutting deep into the tree trunk. Perfect to use for felling trees and bucking logs. A. Cutting trees using an axe and electric chainsaw can get rough on the chainsaw. How can this help? The Oregon felling wedge helps when driven it into the saw cut made behind the blade. It helps by preventing the tree from leaning backward or pinching the saw bar. You may have to drive 3 to 4 wedges into the cut to control the tree fall direction. The tree slowly tips away from the wedge as it’s pushed in with an axe or big hammer. A. Is it possible to use this in between car doors? Yes, it’s safe to use in between car doors as it doesn’t damage the paint. A. How long is the tree falling wedge? It is 5 ½” long. A. Can the wedge be used for splitting wood? Not, it cannot split wood. It is not a plastic splitting wedge and not metal. It’s meant only to control the direction of felling trees, for bucking logs and for preventing trees from pinching the saw bar. If you were apprehensive about buying the Oregon felling wedge, this Oregon Felling Wedge review should dispel all your doubts. It proves that the felling wedge can control the direction of a tree’s fall and is ideal for preventing the saw bar from getting pinched. The Oregon plastic wedge even has serrations on one side to hold it securely in place. Though small in size, the wedge is strong and durable enough to withstand a hammer’s force. And as this is a favorite wedge, you shouldn’t need any other reason to use it!